Bits of Splendor: My Fall Mantle & A Giveaway! One of my favorite little spaces to decorate in our home is the mantle that Brandon built me. I love to change out the look from season to season....I've been adding little touches of "fall" through out the month and am really loving the look....I'm soakin it up a little longer, before it's time to change it out for CHRISTMAS!! The little pumpkin garland was made with mini pumpkins I found at Walmart and fall leaves from Hobby lobby. The silver pumpkin was actually an orange one I found in the Target dollar spot and spray painted with Krylon's Metallic silver, and the orange and white lights were an after Halloween clearance find! I love the mix of colors and how they all somehow work together perfectly! My favorite part is the mustard felt bow garland from my sweet friend Nat at Take the Cannoli. It completes the whole look, don't you think? Do you love it as much as I do? Nat has offered to give one of you a felt bow garland of your own!! She has lots of pretty colors to choose from, and even better, you can choose from her new holiday colors too! I can totally see that gorgeous red one with an all white and silver mantle! If you don't have a mantle, hang this around your door, on your stair railing or a window! Pick a color to decorate for the holidays, or one to stay up all year round! 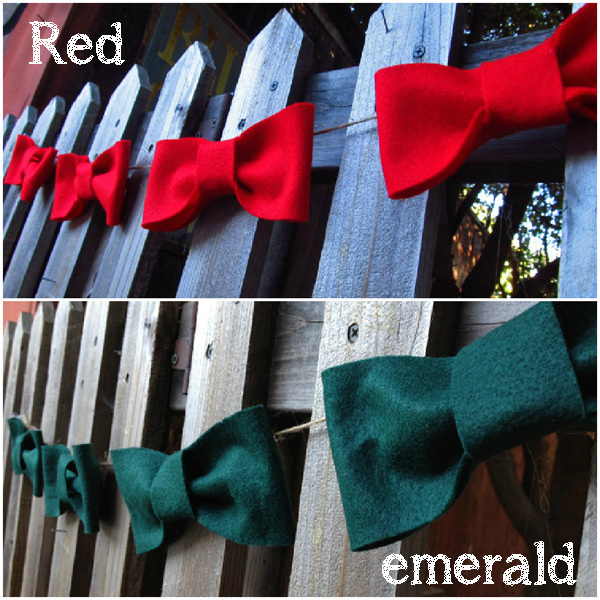 1 winner will get to choose one of these felt bow garlands of your color choice! Tell me what your favorite holiday tradition is! Now whats one of yours? That's 3 chance to win! I'll announce the winner on Friday so be sure to check back in! My favorite family tradition is taking our annual Christmas card picture. How fun! I love your mantel and that garland! I now follow Nat's blog. Hmm... like you, I have so many that it is hard to narrow it down to just one, but I think I love Christmas Eve. Our family gets together the whole day, goes to church that evening, comes home to supper, gifts, and then we sit down together to watch a family movie. My favorite tradition is going to the candlelight service at church together. since my boys were little, one of my favorite holiday traditions is watching the Rockefeller tree light ceremony. we light a fire, make popcorn and hot chocolate, turn the lights down, and snuggle up and watch. For us it sort of kicks off the season. One of my favorite holiday traditions is going to the Christmas Eve service at our church. Now that we're older and living in different cities, it makes it much more special! My favorite holiday tradition is Christmasday. The Sunday after Thanksgiving, we spend the day cutting down our trees and preparing our hearts and home for the Christmas season. I followed take the cannoli! My fave Christmas tradition is Laila's cookie decorating party!!! It was so much fun last year and I can't wait to do it again! My favorite Christmas tradition is opening one present the night before Christmas...it has pj's a Christmas movie, and fun snacks to eat while watching a Christmas movie. its like you are already picking me to win. I have a white mantle. And I have all red and white and silver and sparkle decor for it. So....this red bow garland would look AMAZE. And i'm following Nat now too. My favorite tradition is my renting a Christmas cabin with my moms side of the family!! Crazy but fun! And I already follow Nat! And my favorite Christmas tradition is reading a Children's Christmas story book with my family on Christmas eve! I love when we put the tree up! We turn on music and drink hot chocolate!! Usually we watch Elf together! It's so fun! My favorite holiday tradition is one that my parents started way back when – they give my sister and I new "Christmas Eve Pajamas" that we wear when we wait for Santa to come on Christmas Eve ;) Last Christmas, I roped my husband in to the tradition and got him a pair of Christmas Eve jammies, and this year, we will be carrying it on with our own baby girl who was born in September!! I follow you both, and my favorite Christmas tradition is opening new jammies on Christmas Eve. Everyone gets a new pair, and we put them on right away, so we can open our presents in them. Tried following other blog...wasn't opening on my phone so I liked her on FB. Christmas Eve my father in law reads the Christmas story before we open gifts-there are 9 grandkids 9 and under for a few years they could hardly sit still long enough but as they get older they know its just a tradition and something we do. My favorite holiday tradition is the morning of reading the christmas story in bed with my family. my favorite. my favorite holiday tradition is my family's makeshift 'snowball fight' with our discarded wrapping paper (after opening all our presents). fun times! !